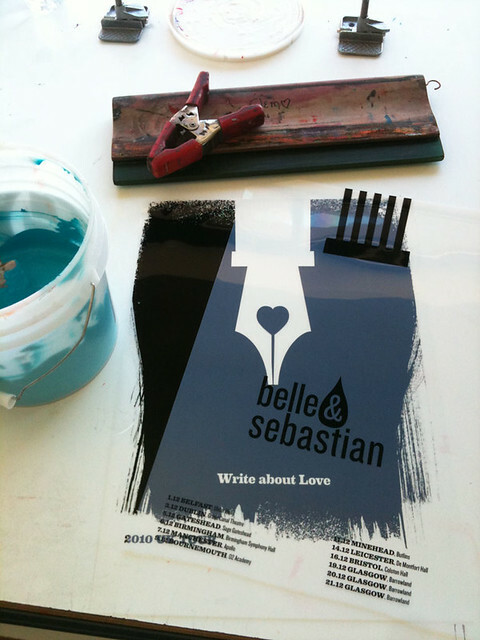 This entry was posted in New designs, New posters, News & Events and tagged 2010, artist, belle and sebastian, black, gig posters, hand printed, hand pulled, hand screenprinted, ink, peacock blue, pen, pittsburgh pa, printmaking, process photos, strawberryluna, studio, teal, tour posters, United Kingdom, write about love by strawberryluna. Bookmark the permalink. Hello there, just wanted to say how ultra LOVELY this print is! I managed to get print no. 326/500 at ATP Bowlie 2, which was curated by Belle & Sebastian, on the 2nd weekend in December. I was straight away struck by the elegant design and vibrant colours. 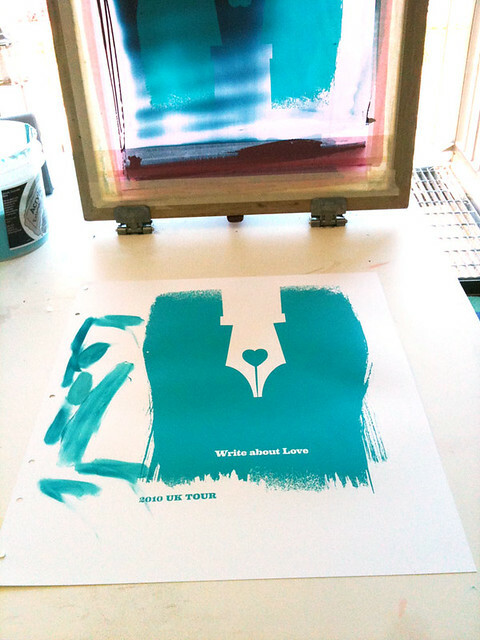 I was torn between the official Bowlie 2 poster and the strawberry luna Write About Love poster. Needless to say, I chose your design because it was too beautiful to resist. I can’t wait to get it framed and hung! 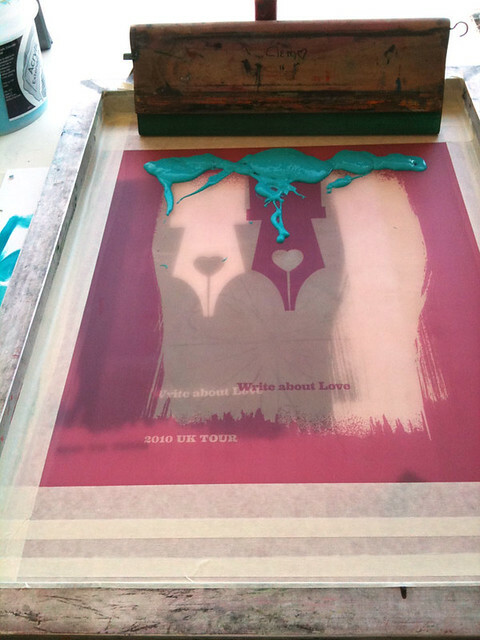 And impressive to find out that they are all hand printed, too. 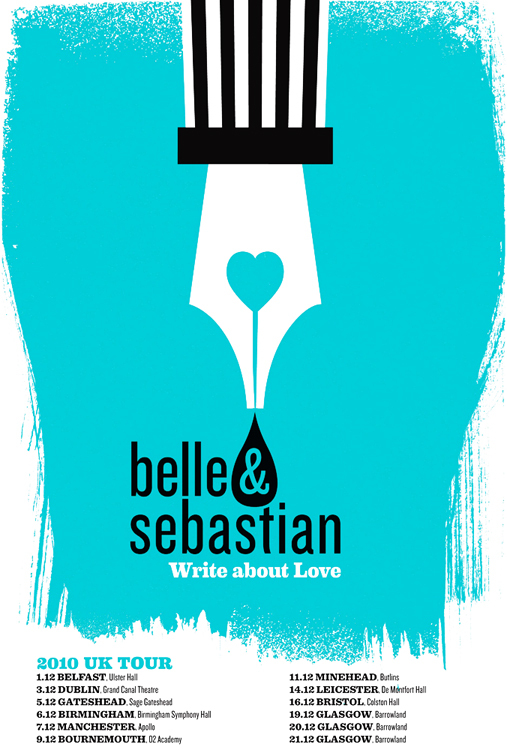 And yes, Belle & Sebastian are one of the bestest bands ever 🙂 You’re enthusiasm is definitely shared! Awww dang, thank you SO much Crystal! And can I just say that I am crazy jealous that you were at Bowlie? We were ding dongs and somehow thought of it as some far off, way too distant thing to try and get to, but once this year came to a close and we were working with our favorites Belle & Sebastian I felt like a dope for not making it a priority right off the bat. It sounds like such an amazing and fun festival in every way. Our friend Michael Michael Motorcycle did the Bowlie poster, so you really couldn’t have gone wrong with either one. He’s amazing. But thanks so much for chosing mine for B+S <3 and I hope that you enjoy! 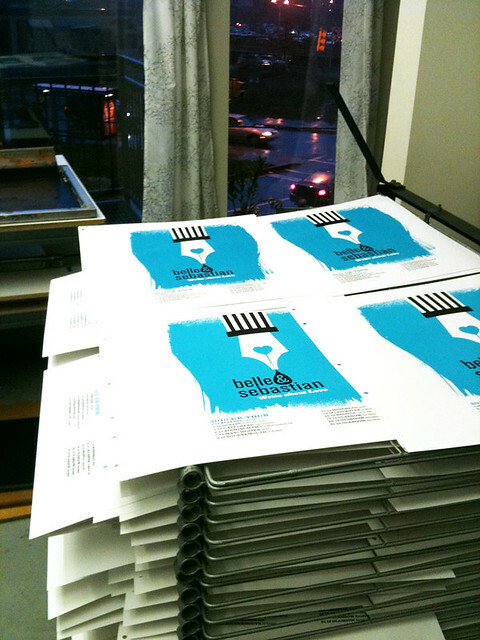 It was quite a feat to hand screenprint them all, but fun and well worth it.